It's hard to recall how I got hooked on French Yé-Yé music. As a music junkie my gateway drug to an artist or genre of music can come from just about anywhere. A cool looking record cover that peaks my interest. A song in a movie. A fellow DJ. A friend. An oddball used record collection that come into the store and in my effort to test play one for condition, the music wins me over. The radio. Truly it can happen in a moment and often and the right song can have me hooked in under 30 seconds. My earliest memory of falling in love with '60s French pop comes from the WFMU record fair in the late '90s. A dealer from Montreal had a table there and he specialized in these records. While I couldn't afford even one of them at the time, he was also selling a CD comp that featured all of the tracks found on the records he was selling. The CD was called Ultra Chicks Vol 1. and it was that collection of material that sent me on what has become a life long obsession with weird/obscure/ fun French music from the late '50s until now. What will be a surprise to many film enthusiasts is Richmond, VA is the home of a quite large and spectacular annual French Film Festival created by a partnership between Virginia Commonwealth University and University of Richmond. (Yeah we do art and basketball here, ha!) Starting today March 24th and running through March 27th we have non stop events and showings of new French films that often include Q&A with directors and the actors / actresses from these films. It is a remarkable cultural event that brings France right into our backyard and I am excited to have a chance to kick the festival off tonight with two hours of French speaking music from the past 5 decades. And if that isn't enough, one of my favorite ladies on the planet will be guest hosting with me tonight. Sara is not only a brilliant local DJ and artist but happens to own one of the best personal collections of lesser known French music I have ever seen. We have cherry picked songs from both of our collections and will be sharing them with you tonight from 7PM to 9PM on WRIR. You can tune in the old fashioned way locally at 97.3 FM on your dial or stream us live anywhere at www.wrir.org. 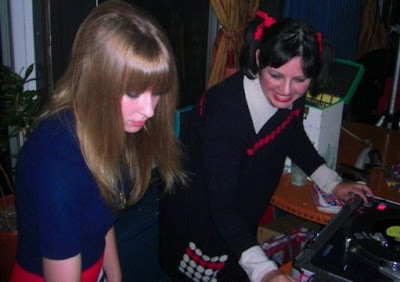 The picture above is Sara and I DJing together at Cous Cous here in town last year and the grin on my face shows just how much I LOVE spinning records with this lovely lady. Here is a general idea of the kind of music we will playing tonight.